As its name might suggest, REIMORY's Color Symphony 2's premise is based on the idea of colour, or more accurately "the ambiguity of colour". A platform puzzle game, Color Symphony 2 allows the player to solve various puzzles by shifting colours, affecting the world you are in. Although it brings some really good ideas, the game itself can get monotonous and could use some more depth in order to achieve its full potential. 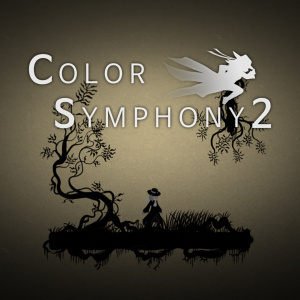 Color Symphony 2 is fairly mysterious throughout; the protagonist himself is very Zorro-esque with a stooped stance and low hat. We actually aren't introduced to much of the story before beginning, although the game tries to flesh itself out with cryptic text across the screen as you progress. The plot is vague throughout, and a little direction or hint at the point of the game would have certainly been welcome. The fragments of the storyline do not really contribute anything to the gameplay, and as the score is based on timing it isn't worth stopping to read it anyway. You progress through short levels which are a mixture of platforms and puzzles; these levels get difficult fairly quickly and might prove a challenge for casual gamers. Each level has a setup which can be changed depending on the colour button so, for example, a yellow obstacle may appear on a red background, but not a yellow, so we have to play around with the colours in order to work out which one will enable us to get past the obstacles effectively. Whilst there are no set difficulty levels, the puzzles get more complicated as time goes on, and it sometimes takes a while to work out the next move as you may have to use more than one colour in order to continue. Each chapter introduces something new, such as enemies, colour portals and moving platforms, so it isn't always just about the colours. 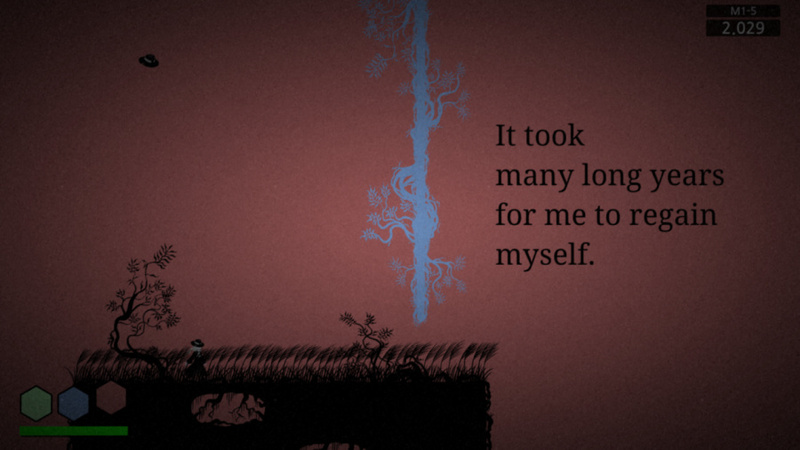 The game has infinite lives, which is handy as sometimes when experimenting with colours the platform beneath you will disappear entirely, sending you to your death before you had even began. The infinite lives mean you are less likely to get frustrated with playing around with the colours, and there is also the option to skip a level if you are stuck, which allows you some freedom from just following the chapters in order. 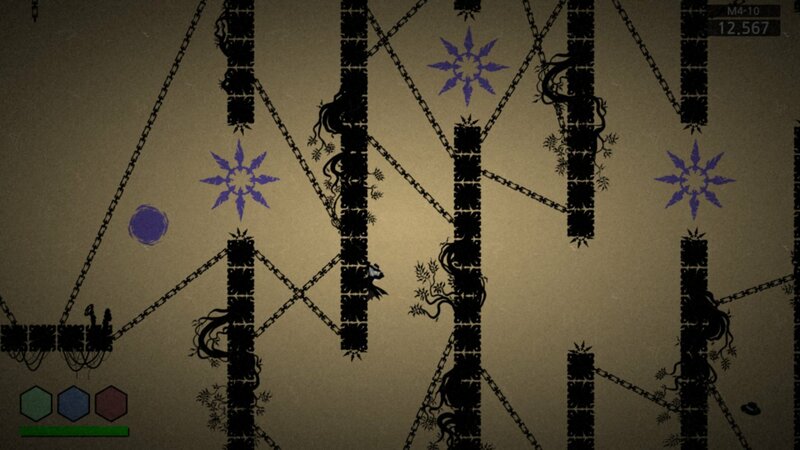 Besides that, though, there isn't much else to do besides unlockable bonus chapters and the occasional achievement. Achievements can be uploaded to Miiverse and shared with friends, but there is no option for multiplayer. There is, however, an option to change the colour swatch for those who have colour blindness or colour weakness, which allows accessibility for more players. The controls are good and responsive, which is needed for Color Symphony 2 as it relies on fast reflexes. The GamePad displays your total number of deaths, and some story excerpts which are rather low-key and don't add much to the experience. There is also a special ability which allows you to hide multiple colours at once for a period of time, but this is the only special ability and for a less linear experience it might have been worth adding a few more. There are 7 chapters with 15 levels for each, so quite a lot of gameplay for your buck, with 3 bonus chapters also unlockable. Color Symphony 2 looks like it takes its influence from Anime in its graphics style, especially with the main character. The simple silhouettes work well against the three colours mechanic, and the character stands out. Sometimes the screen can be too dark, and there is an old film grainy effect which isn't particularly pleasing on the eye. The variations in settings and obstacles could use some work, too, as the same spinning blades are used over and over again and there isn't much in the way of deviating from the same designs; it would have been great to have some new items introduced as the levels develop. Similarly lacking in variation, the audio is jarring and repetitive with very few sound effects. As a lot of the time playing the game is spent thinking, more care could have been taken to find a soundtrack that wasn't so irritating. 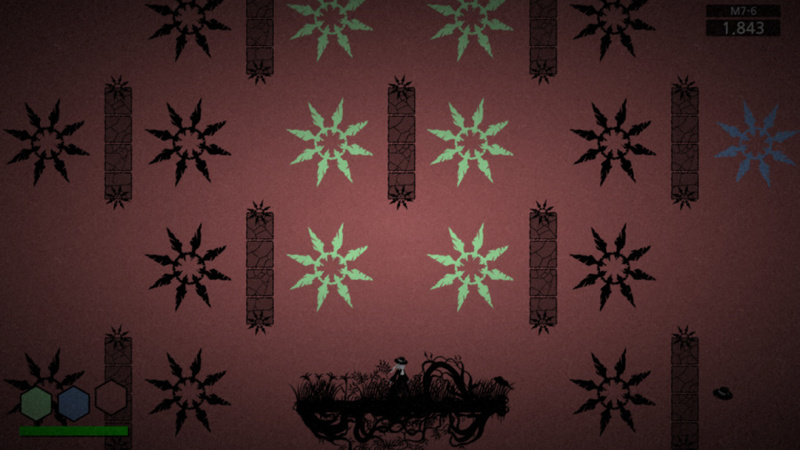 Although Color Symphony 2 introduces an original idea, it needs to work on some aspects in order to draw the player in. The story needs to be fleshed out more, and extra variation in graphics and audio would work wonders to stop the game feeling repetitive. Those who enjoy puzzle platformers will enjoy the premise (at least for a little while), but this could do much more to reel in a wider audience. There seems to be so many of these dull games on the eShop. So much mediocrity releasing on the eShop these days. Well then I'll just stick to Color Symphony 1 which is free on Steam. I saw the trailer and it did look good to me. Might try it someday.